Today's red post collection includes Meddler's quick gameplay thoughts for January 30th, a rundown of recent balance hotfixes, and more! Hey everyone, Ed “SapMagic” Altorfer here on behalf of the Ranked team. 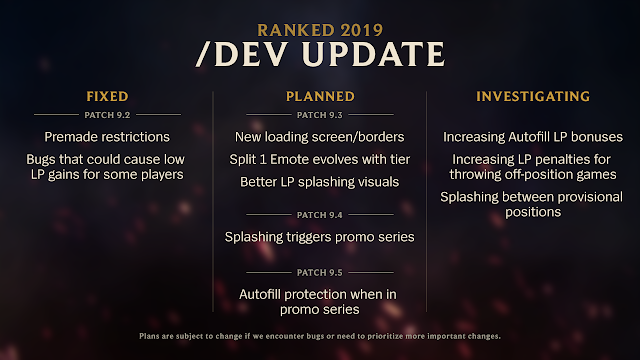 Last week, we kicked off Season 2019 with new tiers, a reworked placements system, split rewards, and—for North America and Korea—a preview of position ranks. Today I want to give you a quick update on how things are going so far, let you know what we have planned for the next few patches, and talk a bit about the things we’re investigating. You can find the key information below. If you want all the details, read on! Issue: Some players were unable to queue together when they should be able to. Early in the season, we discovered some players were unable to queue together, especially if either player had lost their season rewards as a result of punishment. We also uncovered some other issues with premade restrictions, so we fixed them. We will continue to monitor and investigate any reports of premade restrictions not working properly, so hit us up if you feel like you’re encountering issues. Issue: Some players were experiencing abnormally low LP gains. With the introduction of Iron and Grandmaster, and the season reset, some players—especially players who were high Diamond in Season 2018—were getting lower LP gains than expected. There were a variety of reasons for this, but we believe we’ve corrected most of them now. Based on the feedback we’ve received so far, we have some updates planned over the next few patches. Standard disclaimer: Any of these are subject to change if we encounter bugs or need to prioritize more important work. * There may be some extreme situations where we can’t 100% guarantee you’ll get your first choice. We’ll update you again as we get closer to having this ready. Position ranks and splashing are tricky to balance. On one hand, we’ve seen feedback that many players appreciate how the new system makes losing off-position games feel like less of a setback. On the other hand, we’ve heard feedback that it doesn’t feel good to win off-position games. In patch 9.3, we’ll make splashing more prominent on the scoreboard screen. Many players don’t realize they get bonus LP for their main position when they win while autofilled and we think clarifying the current incentive will help. 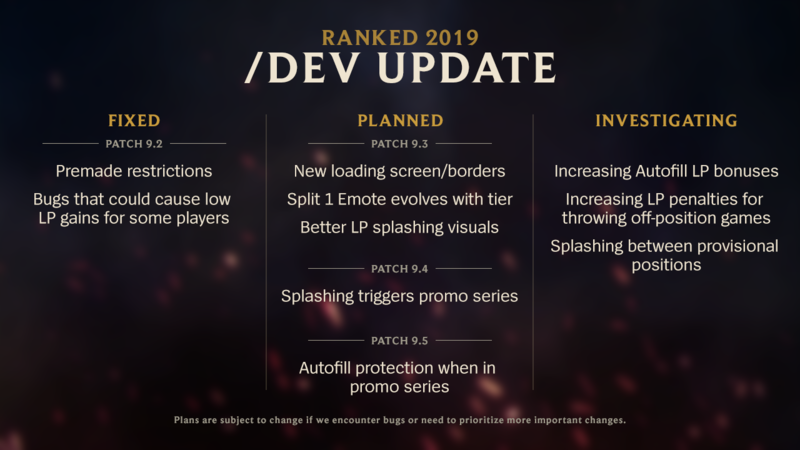 Having said that, we’re also considering additional changes to make those games feel more rewarding, like buffing the bonus LP you earn for your main position when autofilled. We’re also looking at ways we can reward players for hitting Gold or higher in multiple positions as part of season rewards. We’ve heard from you that negative splashing isn’t visible and in some cases it doesn’t punish players hard enough for throwing off-position games. While we haven’t seen a measurable increase in players throwing games, we’re considering tuning negative splashing so it ramps up faster. At the same time, we want to be careful not to punish players who just get unlucky despite trying their best to win. Part of the promise of the new placements system is that you’re protected from losing LP. This is generally true, except with splashing it’s possible to lose LP from a position that’s still in placements. Splashing in general is an important part of preserving competitive integrity, but we’re digging into whether it would be safe to modify the rules for this particular situation. If you’re seeing other issues that aren’t captured here or you just have feedback about the system, let us know in the comments. Thanks for all your help and feedback, and we’ll see you on the Rift!" Damage :: 50/65/80/95/110 >>> 70/85/100/115/130"
Ornn, Reduce incoming damage from 10% -> 20%"
 "One more change. Master Yi deals 5% less damage." We've got some adjustments to how bounties from CSing are calculated coming in 9.3. Our goal with introducing CS based bounties was to recognize when players and their teams were substantially ahead via CS gold and give catch up opportunities in those cases, rather than only when a player was ahead on kills. In some cases that's been working well, in others however players have been ending up with CS bounties not because they're ahead, but because they've caught up since their last death. We'll be making some changes behind the scenes to the CS bounty calculation as a result so that the threshold to hit a bounty better reflects actual game state, meaning that you should only have a bounty from CSing when you're meaningfully ahead. At this point it's likely we'll be taking the healing off Akali Q. We're doing so because we believe the current set of tools Akali has means she's lacking in sufficient weaknesses, in lane in particular. Sustain is generally a tool we give to characters who have weaker all ins, or difficulty making an all in happen when they want. Akali's pretty good in both those regards however. Trying to trade and gradually grind down a champ with all in strength's normally a good response, sufficient healing nullifies that as a weakness however. Couple that with decent waveclear from Akali (in part because she uses energy, not mana), plus decent roaming to take advantage of that pushing, and it's hard to find strong enough weaknesses against her. That lack of clear enough weakness is then amplified again by Akali's ability to flex between multiple positions, allowing her to sometimes take a more advantageous match up. Being a flex pick isn't an inherently problematic thing, but it does add additional power to an already hard to punish kit. It's certainly possible that removing Akali's healing leaves her in a pretty rough spot overall though. In cases like this where a champion's been problematic for an extended period we've had decent success in the past by taking a heavy pass to them to remove issues, then going back and adding power shortly after if needed once we've seen where they've landed. Zoe early last year was a good example of that, proving very difficult to get into an ok spot power and frustration wise with a series of smaller adjustments. Only after we took a really heavy pass and then put some power back in were we able to get her to a better, more stable state. We're looking at potentially bringing Akali's based HP5 up to average, from quite low, in 9.3 alongside the nerf, larger compensation, if needed, would be later though. We’ve got another round of updated walk/run (mainly) animations hitting the PBE shortly. Feedback on these once they’re there much appreciated. As before we’re targeting movement animations generally because they’re seen so often, so they’re a great way to improve a champion’s overall visual quality for the time involved per animation. Dr Mundo - Mundo does things his way. In this case that means getting an updated Q throw animation instead of a walk or run anim. Zyra - New no boots walk"
The 2019 Lunar Revel merch collection is now available, including a new Unlocked Lee Sin statue, God Fist Lee Sin tee, Wukong plush, and more! ""Your will, my hands." The Blind Monk has entered the Unlocked Statue line as #08. Lunar Revel is near and to celebrate we have Lee Sin jumping into the Unlocked Statue line while Wukong sneaks his way to become our next Collectible Plush. Click here to check out the full collection! 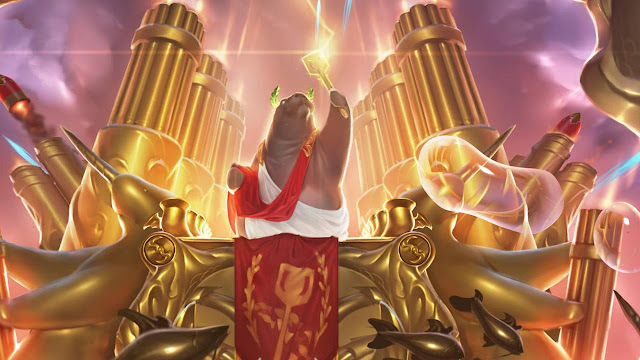 ARURF is now live in Patch 9.2! Learn more here!